Why would you use an email extractor software? No matter the industry, sending a newsletter to customers & prospects is one of the most efficient ways to attract new sales. However, creating your mailing list isn’t as easy as 1-2-3. You need a way to extract email addresses from all your mailing list sources: newsletter subscription forms, prospect emails, Excel files, PDF invoices, etc. 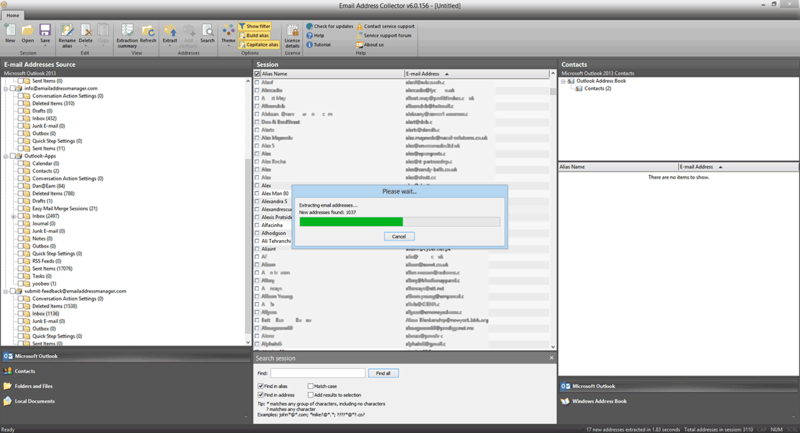 There is one email extractor program that can cover all your sources: Email Address Collector. – other sources such as CSV or HTML files. The email extraction algorithm is greatly optimized so it can easily manage and extract hundreds of thousands of email addresses and eliminate their duplicates. – extract only email addresses of certain domains (like gmail.com or else). – extract only addresses found in purchase receipts (by filtering content keywords that define your receipts). The EAC email extractor program lets you save extracted email addresses as Outlook Contacts, Outlook Distribution Lists, Windows Address Book entries or simply as CSV files that can be quickly imported to any newsletter submission platform. You can even send the extracted addresses directly to an Easy Mail Merge campaign! Our email extractor software can also save the alias names related to each email address that was extracted, allowing you to use these names to customize your newsletter content for each reader. Email Address Collector costs $29.95 for a perpetual license. You don’t have to pay monthly or annual subscriptions: you pay once and use it forever.